We’d love your help. Let us know what’s wrong with this preview of Dear Diary by M.B. Feeney. To ask other readers questions about Dear Diary, please sign up. 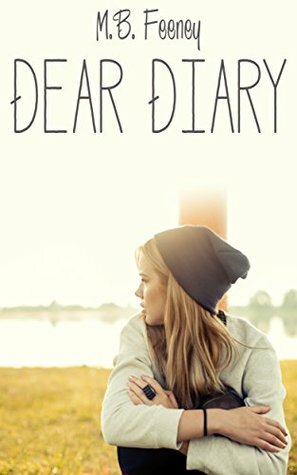 A delightful little short story following Holly and her life-changing trip abroad, Dear Diary was the perfect start to what is looking to be a very promising series. An easy read, made even better by Feeney's laid back style of writing, you are easily hooked in and, if you're anything like me, you'll be reading this book in one sitting. I found myself drawn to Holly's story, following her diary with the same enthusiasm as I would my own if I picked it up in a few years time. Well paced, with a go A delightful little short story following Holly and her life-changing trip abroad, Dear Diary was the perfect start to what is looking to be a very promising series. An easy read, made even better by Feeney's laid back style of writing, you are easily hooked in and, if you're anything like me, you'll be reading this book in one sitting. I found myself drawn to Holly's story, following her diary with the same enthusiasm as I would my own if I picked it up in a few years time. Well paced, with a good variety of plot twists and turns to keep you on your toes, my only disappointment was that I reached the end so soon. The characters were super, Holly was a very typical teenage girl, with Tyler and Aiden having their own charms. Personally, I'm Team Aiden, but that's cause I like a guy in specs! That said, they both have their own charms and it's clear to see what Holly sees in them. This book was one I had been desperate to get stuck into and in this short novella story we meet Holly at the beginning of her adventures - an exchange programme for six weeks to America. Meeting the King brothers would be a life altering moment. Tyler - the brother who is "always brash and full or sheer exuberance" - popular and attractive on the exterior only! Aiden the same grade as Holly at college/school. The clever one who invested heavily in his studies. He was funny and smart and the pai This book was one I had been desperate to get stuck into and in this short novella story we meet Holly at the beginning of her adventures - an exchange programme for six weeks to America. Aiden the same grade as Holly at college/school. The clever one who invested heavily in his studies. He was funny and smart and the pair got really close after few awkward silences! "He was a mystery I wanted to unravel". Upon arriving home though Holly feels more than just a little home-away-from-home sick. I can't help but feel that I left a part of me behind...when I left. A lovely novella and a super short read I flew through in one sitting. Some bits I would have loved expanding on but I now can't wait to get stuck into 'Reluctance' the second book in the Exchange Series and see what happens next! i was hooked on this book from the start, the first couple of entries had me. It brought me right back to my teenage self, trying to pour my hormonal emotions into my little pad locked book. I immediately connected to Holly,she's such a likeable girl down to earth and free spirited. When Tyler king makes an appearance i was even more interested, gorgeous, Big and "brawny". With the later addition of Aiden, Tyler's younger, geekier but just as hot brother i was eager to find out how it all panned o i was hooked on this book from the start, the first couple of entries had me. I immediately connected to Holly,she's such a likeable girl down to earth and free spirited. When Tyler king makes an appearance i was even more interested, gorgeous, Big and "brawny". With the later addition of Aiden, Tyler's younger, geekier but just as hot brother i was eager to find out how it all panned out. Holly makes mistakes and lives and learns the hard way, the way exchanges aren't necessarily supposed to work out. I loved the extracts from Holly, I laughed alot and hung onto each one. So much in such a short space of time. Holly is 17 years old and is headed from her home in the UK to go live in the US for 6 weeks as part of an exchange. But when she gets there she discovers that the King family has two very handsome sons, one in college, Tyler, and one in grade 12, Aiden, with her. The two boys are extremely different and will she find herself attracted to one or the other? I really liked Holly and everything that she went through as a stranger in a new country and trying to fit in the b Holly is 17 years old and is headed from her home in the UK to go live in the US for 6 weeks as part of an exchange. I really liked Holly and everything that she went through as a stranger in a new country and trying to fit in the best she could. She was at such odds within herself for which of the brothers she was attracted to and definitely had a dilemma. I liked seeing the differences in the two brothers although I can't say much as I really don't want to give any spoilers!! When she discovers the Kings have two teenage boys she realises this experience will be more different to what she thought. This book is a short one but it has a lovely story, I found myself just sitting there devouring it in a short space of time. Dear Diary is a short, sweet story. British girl Holly is getting the chance of a lifetime to spend 6 weeks in the US. Her host family is awesome, plus they have two hot sons her age. The problem is that she feels connections to both. Who will she choose? Once again, M.B. Feeney writes a great story line that flows smoothly. In fact, I almost cried because I NEEDED more so badly. I LOVED every minute of it. The characters are very easy to love. Even though it is about teenagers, I recommend to al Dear Diary is a short, sweet story. British girl Holly is getting the chance of a lifetime to spend 6 weeks in the US. Her host family is awesome, plus they have two hot sons her age. The problem is that she feels connections to both. Who will she choose? This short story is about Holly, a British exchange student who goes to live with Tyler and his family in the States for six weeks. I like the format of it being diary entries, taking me back to my teenage years! The majority of the story was predictable - girls meets guy (s! ), girl is attracted to guys, girl becomes confused. But, it flowed really well and had me wanting to keep reading. The ending I didn't quite predict though! The relationship between all of the characters was believable and This short story is about Holly, a British exchange student who goes to live with Tyler and his family in the States for six weeks. I like the format of it being diary entries, taking me back to my teenage years! I loved this super short novella with a passion. It was beautiful, fluffy, upbeat and emotional. Holly’s a British gal doing a six week program in the U.S. for life experience, what she didn’t expect was the two brothers she was staying with. They’re both polar opposites of each other and hate each other with a vengeance. What she didn’t anticipate was going home a different girl. I enjoyed where this story wen and with how it ended. I read this book in just under two hours. It's short, sweet and well written. MB Feeney is a fantastic short story writer. This is a great read; it's a little bit saucy, but definitely heartwarming. A young ladies life is turned upside down when she visits America, that's all I'm going to say about this book. I don't give away spoilers. If you are looking for a quick YA read, then look no further and 1-click today. Great job Mich, I look forward to reading more from you. I thought "Dear Diary" by M.B. Feeney was an amazing story. Having been an exchange-student myself from Iowa to Germany, I loved this book. It brought back all of my wonderful memories with my host-families. I thought this book was incredibly sweet and that Holly and the King family were not only likable characters, but also relatable. I was so sucked into this book that I couldn't put it down. This is the first book in a series and now I want to read more! Dear Diary is the story of Holly, a British exchange student who comes to the US and finds herself torn between two brothers (who just happen to be members of her host family). I enjoy M.B. Feeney's writing style and loved that the entire story was told through Holly's diary. This book is geared toward upper YA/NA readers and is a short, easy read. Definitely a coming of age story that teaches some important life and heart lessons. Oh my gosh, that was freaking brilliant. I absolutely adored every single bit of it. I loved that it was all diary entries and I loved reading about Holly's experiences at the King's as she stayed there for a few weeks. I loved everything about Aiden, he's such a sweetheart, where do j find one of him? Ha ha. Everything was absolutely lovely. The characters, the descriptions, the storyline just everything. Another great read from M.B. Feeney. Just Wow. I know it's only a short story but it is like a full book. Told as Diary entries it doesn't leave any gaps. An easy laid back read. Following Holly's school exchange to America, she writes in her diary of what's happening and how she is feeling. I loved every bit of this story I read it in about an hour. Now I can't wait to read more of M.B. Feeney's work. Wonderfully written short story told by Holly in her own words of her visit to the U.S. and her host family. I can only hope we get more from Holly as she continues on with life. Quick read, and I really like the diary style that it is written in. Can't wait to pick up the rest of the series! A wonderful way to tell a story. Dear Diary is Holly's story through her words in her diary. I loved the characters and their story. It's a short read but really sweet with a lovely ending!